Chart shows product features of popular additives. 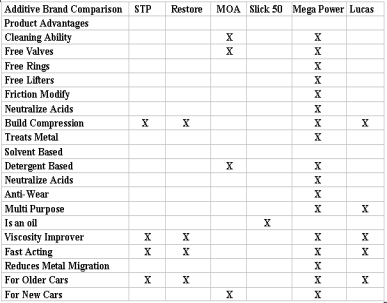 Engine Transmission Additive Comparison Chart shows why our product recommendation features actually fix car or equipment problems - Why others can't! Hi! About today's engine transmission additives. Their problem-solving, problem-preventing advantages are growing, and some may be what your engine, transmission, radiator, and power steering needs. To end a wear or residue causing problem. If additives are not familiar to you, they are explained on the page you go to. Read the review below = or try the links to find the page info you need. The fix you need. How they work. The install - all explained here for you. Products shown correct engine, transmission, or other component running, power decline, oil burning, noise, shift, leaks and dozens of other conditions that will, after doing what we show you to do, will end your worrisome and or puzzling car problem. 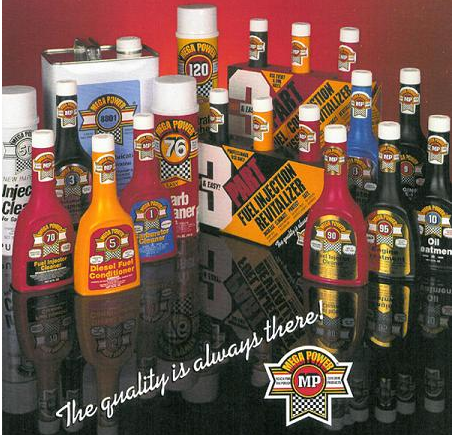 As experts in all this, we also train tune and repair shops and dealerships in their usage - that want the newest and best for their customers - instead of the traditional 50 year old single-action, weaker additives in common use. This info, and product tips will give you the right fix to end that worry. They provide professional results and easy to do so. The method we offer fixes, or ends your vehicle problem - sometimes several problems making the main problem, by reversing the mechanical condition causing the problems. Does so by cleaning, freeing, smoothing, healing, filling their worn spaces, an adding a slippery anti-wear protector over every part. Products that do so shown here, from Mega Power, and Slo-wear Fix-better Longer Engine Transmission Additives Treatment. What this results in to end your car problem. Changes dirty and wear roughen, problem causing conditions to a nearly like new clean, former trouble free operating condition. A complex, advantages fix, most certainly, to your cars hidden, complex problem. What dismantling and repair use to do, this does chemically. It returns the so treated component to what it was years earlier when cleaner and less worn - but by chemical means. Is this what you're after? How is it installed? And what will I see happen? You, or if a shop sells it, installs it as shown - its easy. Nothing to take apart. A liquid you add to the fluids. Driving caused the problem -Now, driving does the fix with this product in it. Results happen in as little as 10 minutes. To a week of driving. Why does it work when other products can't? Research into new types of chemistry and field test to see what works and why. Its background is years ahead of anything else. They're not like part store or quick lube additives out of some suppliers barrel. Their high success rate works 95 times out of 100. If not your money refunded. What do customers tell us about their fix? Customer success with this product ends their problem and this avoids repair, or use it to put off repair - using its revitalization features, to help then do so for many years. When with repair, it enhances and restores older, half worn parts to work well along with new parts - This feature makes repaired or tuned motors run as-if-new again. Can it be added to new or newer vehicles? It was installed to fix new car engines that had a rapid wear problem - which it avoids. It does the ssame in rebuilt and overhauled engines transmissions and compressors to stop or prevent that very problem - which is a life shortening problem it avoids for the rebuilder. It is a re-conditioner for half worn parts inside to stop their rapid wear out. Of course, you would not know this feature unless you seen it in hundreds of causes over the years. What you see or hear or fell is an end of the problem! A easier crank start, run when cold and hot. Power as if having a bigger engine - as horsepower lost is recovered in combustion and along to the wheels. With aged or hi-mileage vehicles, this product is the way to revitalize them. And help them put off or avoid aging and wear and tear problems. All those advantages and benefit stated are gained when following out tips, suggestions, products made to end your vehicles problems, and for avoiding or putting off their repair. Adds more years life, and trouble-free usage to new and older worn cars, pick ups, diesel trucks, tractors, RV's, boat engines, motorcycles - even machinery. Install is simple. 2 steps. And driving. 2 refunds requested last 267 days. Ordering info for car and or big rigs. Repair shops order in sets of 6 usually. Treatments consist of 6 items, including and covering as the treatment: For engine fuel systems, for engine interior, for tune ups assist, and for engines needing wear and residue problem resolving. And similar for transmission, radiator power steering and a/c servicing and problem solving. Help from monthly lessons, newsletters, sales tips install tips, problem recognition and remedy, advert suggestions, email and direct mail assist programs, what to do, say, sales points, pricing. and any warranty help needed. Included with tune ups, repairs, servicing, this chemically helps older parts remaining last as long a the new parts. We drive tomorrows cars. We have their problem solvers. Avoids future surprises from deep in your motor or transmission this way. Way cheaper than actual repair. Its the repair method of tomorrow - for today! Comes as a 2 step, easy-to-install treatment. To clean and free. Then smooth, fill worn spaces, add its slippery anti-wear protection which ends the problem. Some people don't like, trust, use these additives. But I do! Many do! My neighbor has car engine trouble. I tell him to try what I use. He says," He tried additives. They do nothing or make the problem worst, from his experience!" Some mechanics also say the same things. A few trained by us say, "Not so!" My neighbor spends thousands on overhauls or more on new car replacement, as his vehicles seem to wear out prematurely. My are now older, still run great. Need brakes and stuff - but still run almost like new - while my neighbor has his in the shop for 2 weeks getying overhauled. What do you think? I like my method of care and so do many others compared to his. Try it and see for your self by ordering the whole vehicle treatment as a toital fuild replacement and service . or just the component in trouble . engine transmissison service treatment we promote. I'm telling you about! Tune repair shops trained in this products usage charge from to $250 to $450 for the revitalization and problem-solving treatment. If you can feel comfortable adding it to your fuel and oil. Its just under $100. Now you know what you should know - Select one of fvollowing links for the exact info and fix product to restore your vehicles former condition. ENGINE TRANSMISSION ADDITIVES TO FIX YOUR CAR RUNNING PROBLEM FASTER, CHEAPER - maybe even better! For DIESEL AND GAS POWERED ENGINES AND TRANSMISSIONS. You now have here for you, today's newest engine transmission additive features, providing you a new easier way to correct your car and equipment running, and operating negatives - Those once requiring a costly repair to do so. Order items needed on the page you go to. Enjoy tomorrow's ways to fix your cars today!